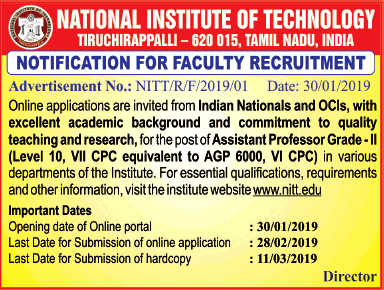 National Institute of Technology, Trichy, has advertised in THE TIMES OF INDIA newspaper for recruitment of Assistant Professor (Grade II) jobs vacancies. Interested and eligible job aspirants are requested to apply online on or before 28th February 2019. Check out further more details below. About College: The National Institute of Technology (formerly known as Regional Engineering College) Tiruchirappalli, situated in the heart of Tamil Nadu on the banks of the river Cauvery, was started as a joint and co-operative venture of the Government of India and the Government of Tamil Nadu during 1964 with a view to catering to the needs of man-power in technology for the Country. The College has subsequently been conferred with autonomy in financial and administrative matters to achieve rapid development. Because of this rich experience, this institution was granted Deemed University Status with the approval of the University Grants Commission, the All India Council for Technical Education and the Govt. of India in the year 2003 and was renamed as National Institute of Technology. NITT was registered under the Societies Registration Act XXVII of 1975. How to Apply: Interested and eligible candidates are requested to apply ONLINE at the official web address provided below and then send hard copy of online application form.